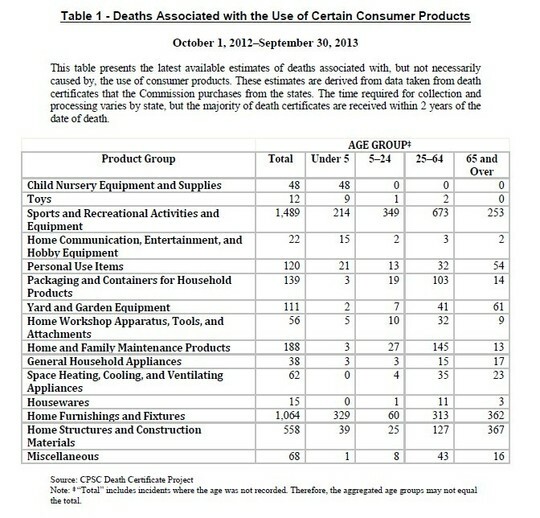 The Office of Vital Records (OVR) provides information to the CPSC about deaths caused by or related to consumer products. Each year the CPSC provides OVR with a list of ICD-10 (International Classification of Diseases, 10th Version) codes that they have selected for which they want death information. After death records are completed, OVR sends an electronic file of raw data that medical certifiers provide for the cause and manner of death to the National Center for Health Statistics (NCHS). NCHS reviews the records and assigns ICD-10 codes to the causes of death reported on the death record. OVR receives a file of coded records in return. The CPSC is interested in certain ICD-10 codes that relate to deaths that involve consumer products. Medical certifiers play an important role by providing a complete cause of death and injury description, and identifying any products involved. Medical certifiers help protect the public and make a valuable and vital contribution to public health. As partners in vital records and as consumers, the CPSC is important. If you have had a safety problem with a consumer product, see the Consumer Product Safety Commission to report an unsafe consumer product, see a list of free CPSC safety guides and for product safety information. The following table is from the 2016 Annual Report to the President and Congress, the most recent information available from the CPSC. Vital records partners, Mike Carroll, mortician and owner of the Olson and Swanson Chapels in Rush City and Pine City; Susan Anderson, Anoka County Record Services Supervisor; and Mike Burakowski, Hennepin County Medical Examiner’s Office Investigations Supervisor, shared ideas and feedback as panelists at OVR’s “customer focus” staff engagement training on June 27, 2018, in St. Paul. In 2016, Minnesota death certificates changed. The U.S. Standard Certificate of Death serves as the model for jurisdictions including Minnesota. Published by the National Center for Health Statistics, the certificate only allows for the surviving spouse’s first, middle, and last name before first marriage to be on the record. Up until 2015, this is all that Minnesota death registration allowed for as well. After requests from morticians, funeral staff, local registrars and the public, the Office of Vital Records (OVR) added a data field for ‘surviving spouse’s married last name’. This is an optional data field in MR&C. If collected, the surviving spouse’s married last name prints on Minnesota death certificates. In 2016, the first year that the married last name option was available, 49 percent of the records that had a surviving spouse had the field completed. Last year, 59 percent of the eligible records had the data recorded, and so far, for 2018, only 58 percent have it completed. When registering fact of death information, OVR encourages funeral directors to ask all surviving spouses for their last names before first marriage and their current (married) last name. Take advantage of the optional data field and record the married last name in MR&C on the Decedent III page, in the “Surviving spouse’s information” box. The spouse’s married last name will print on the legal death certificate. During the years 1997 – 2001, Minnesota started registering deaths electronically. Copies of death certificates for records filed on paper before 1997, and those filed on paper between 1997 and 2001 are available in the county where the death occurred from the county office, or from the Office of Vital Records in St. Paul. Most death records filed on paper are “indexed” in Minnesota Registration & Certification (MR&C). This means that the records contain only the decedent’s name, date of birth, birth place, date of death, state and county of death, and state file number. They do not have any medical information. You can easily identify these records. When you look these records up, the search results show that the records are “UNFINISHED”. In MR&C, enter a customer service request and add the payment as usual. On the Request Item Details page, search for and link the “unfinished” death record to the request. Click Send for fulfillment on the Request Summary page to change the request status to “Pending”. Return to the Request Item Details page and change the request status to “Fulfilled”. Save the page. NOTE: Not all issuance office users can change the request item status. If you do not have this option, ask your manager or someone with the Administrative security role in MR&C to change the status. Make a copy of the paper death record on plain paper. NOTE: original paper death records may be stored as images on microfilm. Add the county seal/stamp or emboss the copy if the customer requested a certified copy. Ever in U.S. Armed Forces? Information about individuals, including their military service, is important to accurate and complete death registration. The Office of Vital Records (OVR) Help Desk receives questions about how to record decedents’ military service status when the decedent was a member of the National Guard. Minnesota death data is consistent with the U.S. Standard Death Certificate published by the Centers for Disease Control and Prevention, National Center for Health Statistics. When registering the facts of death in the Minnesota Registration and Certification (MR&C) System, users must answer this question about the decedent, “Ever in U.S. Armed Forces?”. You can find this question on the MR&C Decedent II page in the box labeled, “Decedent’s education and occupational information.” MR&C responses include YES, NO, and Unknown. If a decedent served in the U.S. Armed Forces as a member of the National Guard or in any capacity, indicate YES. Accurate data about service in the U.S. Armed Forces is important to families and others.